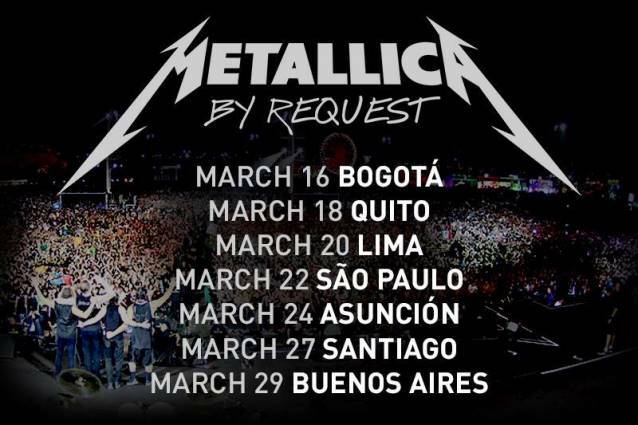 METALLICA played a brand new song, "The Lords Of Summer", live for the first time earlier tonight (Sunday, March 16) during the opening concert of the band's South American tour in Bogota, Colombia. The trek features the band playing all-request shows, and introduces the new track into the group's set. The first fan-filmed video footage of the complete "The Lords Of Summer" performance can be seen below. METALLICA guitarist Kirk Hammett recently told the U.K. magazine Kerrang! that the band "cannot think of any other reasons to procrastinate" over the making of their 10th studio album, which is slated to begin this year. He added, "We're kind of backed up into the corner now, so yes, we have to start working on the album. And I'm excited. James [Hetfield, frontman] has, like, 800 riffs. I only have 400, but there's not going to be any shortage of ideas. It's going to be interesting to see how it turns out." Hammett offered one reason why the band has delayed the start of work on the record, saying, "We're only procrastinating because we love being at home with our families, but we really do love writing songs together and making an album." 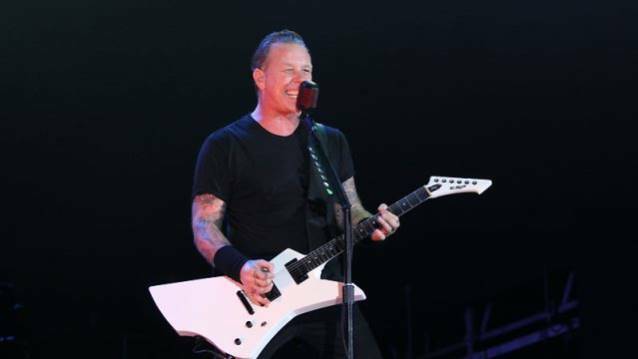 Aside from touring, METALLICA has spent much of the five-plus years since the release of its last effort, "Death Magnetic", on several other projects, including launching a music festival, collaborating on an album with the late Lou Reed and making a feature film. Drummer Lars Ulrich told The Pulse Of Radio not long ago that spending all its time making an album is no longer a priority for METALLICA. "If we had to sit there and, 'Okay, boys, now you write for the rest of the year and then you spend the next year after that recording' — I would pull what seven hairs I have left, I'd pull those out and rather just stab myself in the eye with nails or whatever," he said. "I just, I couldn't do it. I mean, we love the position that we're in to be able to come and go between all these different projects. That's what keeps us alive." In a 2013 interview with Kerrang!, Ulrich spoke about the band's mindset going into the songwriting phase for its next album. He explained: "The only thing I can tell you is that there seems to be a consensus in the band that 'Death Magnetic' was a really good record that we're proud of, that had good legs on it — meaning that it still sounds really rocking five years later. And I can tell you that with most of the previous METALLICA records, I found any faults, I had any issues with them way, way sooner than five years. So the stuff that we've been jamming on is certainly not a million miles removed from where we left off from 'Death Magnetic'. But two years from now, when I sit and talk to you about the new record, it'll probably be a different story from the six-year-old looking for the ice cream shop."